August 2016 – Valentina E.
Don’t miss the new Valentina E. Nightingale Fringe Bikini out exclusively at The Fantasy Collective! Available in four color options and Maitreya Lara, Slink Physique/Hourglass and Standard Small/Medium Sizes. Don’t miss it! NEW! 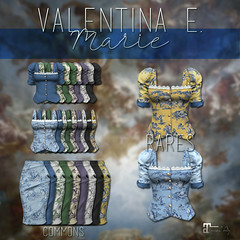 Valentina E. Hopeless Romantic Dress @ Shiny Shabby! NEW! Valentina E. Hopeless Romantic Dress exclusively at Shiny Shabby! Available in five colors in Maitreya, Slink & Standard Sizes exclusively at this special event. Don’t miss it! NEW! Valentina E. Garbo Gacha@ Whimsical! Coming to Whimsical August 18th the new Valentina E. Garbo Glove Gacha only at this special event! 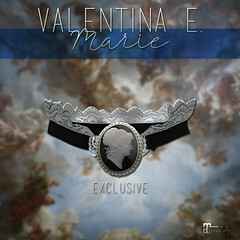 Exclusively for Maitreya Lara. Don’t miss it! NEW! Valentina E. Metallic Tissue Mini Dress @ FaMESHed! Out at noon August 1st exclusively at FaMESHed, the new Valentina E. Metallic Tissue Mini Dress! This flirty dress features a tantalizing peek at lace undies under sumptuous silk fabric. Available in four color options at Maitreya Lara, Slink Hourglass/Physique, and Standard Small/Medium Sizes. Don’t miss it!